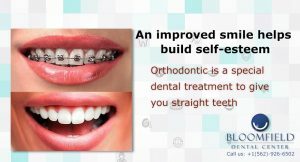 Orthodontic is a special dental treatment to give you straight teeth, orthodontists are dentists that specialize in the alignment of teeth and some other dental services like misaligned teeth, crowded teeth, Spacing, overbite and underbite. At Bloomfield Dental Center Dr. Lisa Angelici our Ortho specialist, has developed and followed certain procedures in helping all her cases, her goal for all her patient is to achieve healthy and beautiful smile that will last for lifetime. Diagnostics (Evaluation) the goal of this step to make sure your overall health and dental issues are under control before treatment begins. Casting to create a model of your teeth to see the position of each tooth and how it relates to the other teeth. X-rays to see the root of each tooth and to determine any pre-existing damages. Intra oral camera is a fantastic tool to take photographs of your existing case so you can see the improvements after the treatment is completed, also can be used for diagnostics. Customize a treatment plan for you the plan will include the recommended devices to be used best with your case. Start the actual treatment plan and applying the needed device for your case. After the treatment required time is over and everything looks great we must make sure that your teeth will not shift back to their original position. The ortho treatment length can take anywhere between 1 and 2 years it depends on so many factors in your case such as age overall health conditions and the dental condition of the misaligned teeth that needs to be corrected.